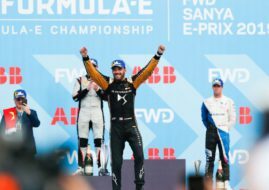 The DS Virgin Racing driver Sam Bird completed a perfect Formula E weekend in New York by winning the both ePrix rounds. Even after missing out the New York ePrix, Sebastien Buemi still tops the standings with an advantage of 10 points to Lucas Di Grassi. Sam Bird, the winner of the Saturday’s race, started from pole position on Sunday after beating Felix Rosenqvist by just 0.037s. Jean-Eric Vergne and Pierre Gasly occupied the second starting row while Nick Heidfeld and Maro Engel started from the third row. Championship title contender Lucas Di Grassi again did below the expectations as he was 9th in qualifying. On Turn 1, Rosenqvist took the lead from Bird while Heidfeld switched positions with Gasly. Soon after, Bird was able to retake the lead from Rosenqvist and before the pit stop there was a lot of action and accidents. Daniel Abt, Mitch Evans, Maro Engel, and Alex Lynn all were kicked out of the race. After the pit stop standings at the top remained unchanged. Bird had a solid advantage to two Mahindra cars of Rosenqvist and Heidfeld. Gasly was sitting in 4th place while Di Grassi moved up to the 5th position but was well behind the Renault e.Dams driver. On lap 37 Heidfeld and Rosenqvist switched positions but the Swede took back P2 on the penultimate lap. However, none of them was able to challenge Bird who scored the second win in two days, becoming only the second man in the history of the series who managed to win both races of the weekend. Gasly held off Di Grassi to take P4 while Nico Prost, Tom Dillmann, Jean-Eric Vergne, Robin Frijns and Jerome D’Ambrosio also scored points in the second race of the weekend. The final two rounds of the FIA Formula E Championship will be held in Montreal, July 29-30.